LA PAZ, Dec 22 (IPS) - Indigenous people, who make up more than 60 percent of the population in Bolivia, South America's poorest country, are taking their first steps towards self-government under their own cultural traditions that date back to pre-colonial times. Alongside the Dec. 6 presidential and legislative elections, 12 of Bolivia's 327 municipalities voted in favour of indigenous self-government, which will give them control over the natural resources on their land and a greater say in how to use funds transferred from the central state, as well as redefining how government funds are disbursed. In addition, legal disputes and crimes in those municipalities will be tried in traditional local courts, and elections will be organised and community leaders appointed according to native customs, which are based on a tradition of consensus-building. But because the concept of indigenous autonomy is brand new, the details on how it will function must still be legislated by Congress after it reconvenes in 2010. In the elections, leftist Evo Morales, the country's first-ever indigenous president, was reelected in a landslide victory with 63 percent of the vote, and his Movement to Socialism (MAS) party won a two-thirds majority in both houses of Congress, which will allow it to move forward with important legislation such as the question of the indigenous right to self-rule. Although most native people in Bolivia belong to the large Aymara and Quechua communities and live in the western highlands, there are a total of 36 different indigenous groups. The new constitution that went into effect in February after winning the support of 61 percent of voters in a referendum recognises that Bolivia is a "multi-national" state made up of peoples who have a right to autonomy and the right to preserve their culture. Since first taking office in January 2006, Morales has accelerated and expanded the country's land reform efforts, granting formal collective land titles to indigenous communities, known as Tierras Comunitarias de Origen or TCOs, a process that also involves recognition of native communities and their collective legal rights. Simultaneously with the elections, the departments (provinces) of Chuquisaca, La Paz, Cochabamba, Oruro and Potosí voted for provincial autonomy. Similar autonomy referendums had already been held in 2008 in the departments of Santa Cruz, Beni, Pando and Tarija, the so-called "eastern crescent", which account for most of the country's natural gas production, industry, agribusiness and GDP and have a lighter-skinned population of mainly mixed-race and European descent. The referendums by the "eastern crescent" departments were a challenge to the Morales administration by their right-wing governors, and were criticised as an attempt at secession. The aim was decentralisation and greater control over the revenues from the natural gas and other resources in their departments by means of the creation of provincial assemblies and local tax collection mechanisms. Bolivia’s natural gas reserves, the second-largest in South America after Venezuela’s, bring in 1.2 billion dollars a year in taxes and royalties, and are the country’s main source of foreign exchange. The chief support base of Morales and his party are the country’s indigenous majority, based in Bolivia’s impoverished western highlands. Now that the five remaining departments voted for autonomy, all nine will have the same legal status. A recent seminar organised by the Centre for Studies of Labour and Agrarian Development (CEDLA) examined the increasing political organisation of the indigenous movement in Bolivia and other countries in Latin America. 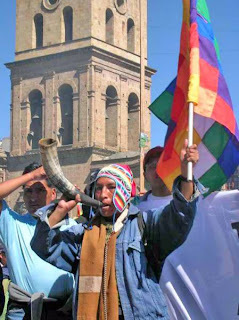 Indigenous people in Bolivia have been historically downtrodden and marginalised, only gaining full suffrage rights in 1952. Even today, some Indians continue to work as serfs on large estates owned by the European or mixed-race elite. But since the 1980s they have become increasingly organised. And the 2001 census, which found that 62 percent of the population identified themselves as members of one of the country's 36 indigenous groups, strengthened this process. In Tinguipaya, a municipality covering 80,000 hectares in the southwestern highlands department of Potosí, the president of the traditional local council, Paulino Menacho, told IPS with enthusiasm that he hopes the town will soon have indigenous self-government under a chief with the traditional title of "curaka" - which dates back to the times of the Inca - a position that would replace the current office of mayor. According to local tradition, the office of curaka would rotate from family to family under the "muyu" system. But Menacho is worried about the shortage of farmland for the 16,000 people under his authority, who may be assigned plots of up to just 200 square metres in the land reform process - insufficient to sustain the region through agriculture, since not all of the land is apt for farming or livestock-raising in this highlands region. The members of the eight "ayllus" or clans in the area want a redistribution of the 1.7 million dollars a year in funds that come from the central government, saying they now only actually receive half of the total and are not sure what happens to the other half. They would also like to create local taxes and leasing charges - on "fair terms" - for companies exploiting minerals, limestone, water and other natural resources in the area. Hundreds of kilometres away, in the rainforest and cattle ranches of the northern department of Beni, the secretary general of the Moxeño Ethnic Peoples of Beni (CPEMB), Francisco Maza, says the time for self-government has arrived. For the small indigenous communities in the remote department, the struggle began in 1990 when hundreds of them marched 640 km from Trinidad, the provincial capital, to La Paz, demanding respect for their right to land, as they faced intense pressure from landowners, ranchers and loggers constantly encroaching on their ancestral territory. "We are asking for autonomy not only over our territory, but in earning a share of revenues from the exploitation of lumber and other resources in the region," Maza told IPS. The challenge of creating specific legislation on indigenous self-government is made more complex by the diversity of local customs in the country's different indigenous groups, especially among the 29 smaller native communities in the eastern lowlands, which each have their own forms of government. Much of the land of the Moxeño Indians is rich in biodiversity, natural gas, and a wide variety of timber species. The hope of the indigenous groups is to begin to share in the wealth currently reaped by private landowners and companies. CEDLA researcher for public policies Juan Luis Espada told IPS that the central government will have to increase funds to autonomous indigenous governments, because few of them will obtain additional royalties for natural gas exploitation, for example. He also said the autonomous local governments would face a learning curve in terms of administration, the creation of new local and regional taxes, and the division of functions and authority. "Many political and social challenges lie ahead in the search for a model of self-government that will respond to the long-standing demands of native groups who require continued attention from the government and who want to participate in the administration of the state apparatus," said Espada.